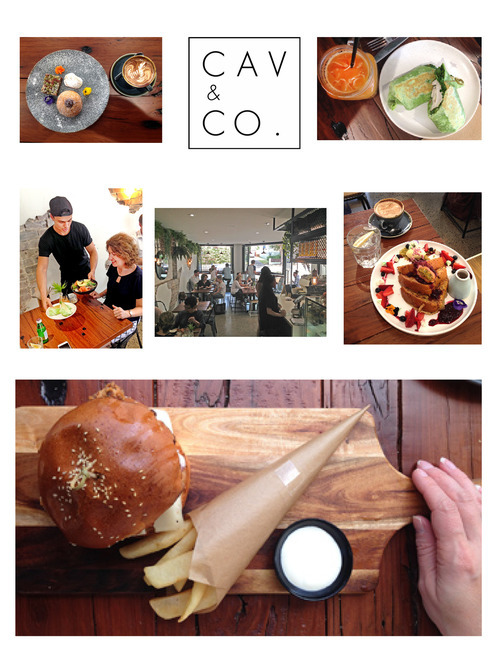 Cav & Co is a stylish café in Gladesville. 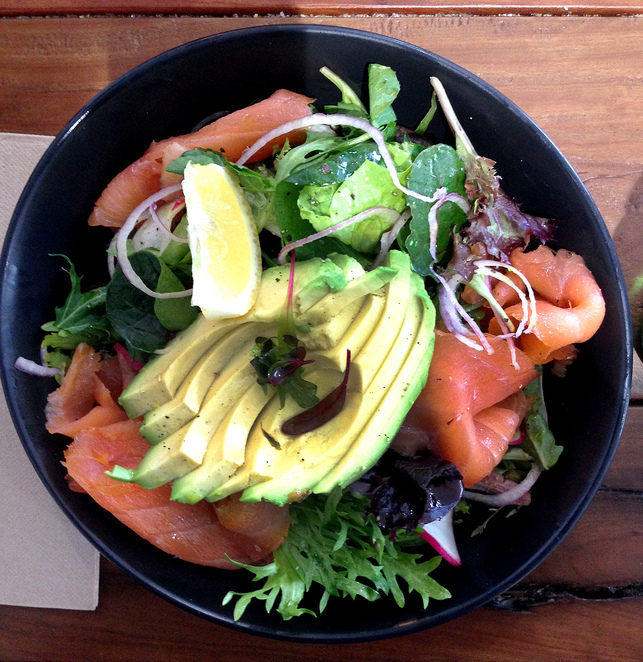 It's on Pittwater Road, tucked away from the main shopping strip of Victoria Road. Having driven past the café a few times, my work colleague and I decided to give it a try. 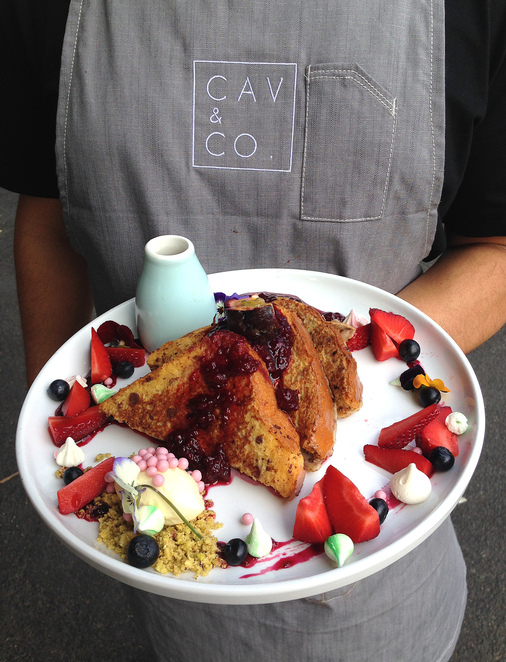 Michael and Amanda Cavallaro opened Cav & Co in June this year with a fresh, hip design and a creative menu to rival any city café. "We gutted the whole place with lots of family help. 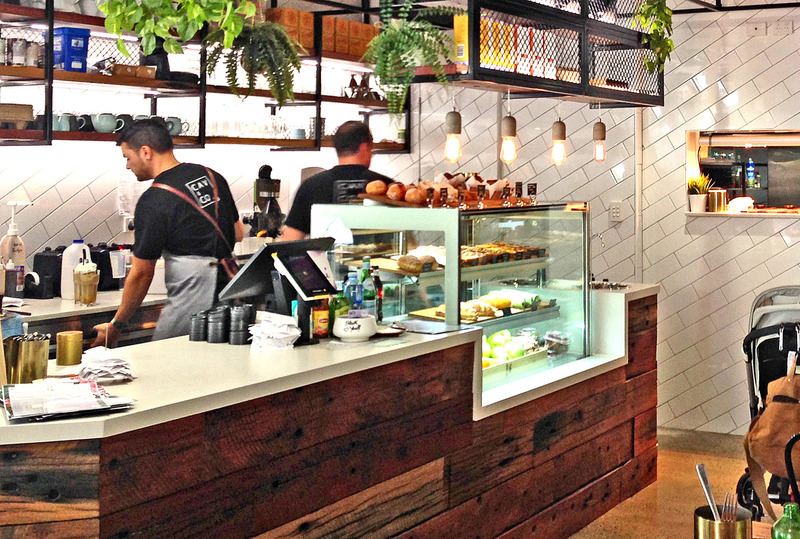 Our café really is a labour of love," says Amanda as she shows us to our table. With eco-friendly fittings of timber tables and counter made from recycled train track sleepers handpicked by both owners, the café has a bright, well-lit atmosphere. Exposed brick walls, retro fittings, comfy chairs as well as window seating with daily papers and current magazines for you to read, all add to the relaxed feel. The café has an inviting community feel with many returning customers who also frequented Cavalicious, their first café on Victoria Road. "We had Cavalicious for six years and many of our regulars became friends. We love that feeling of our customers becoming a part of our café family," Amanda tells us with the look of pride that comes from achieving your goals. 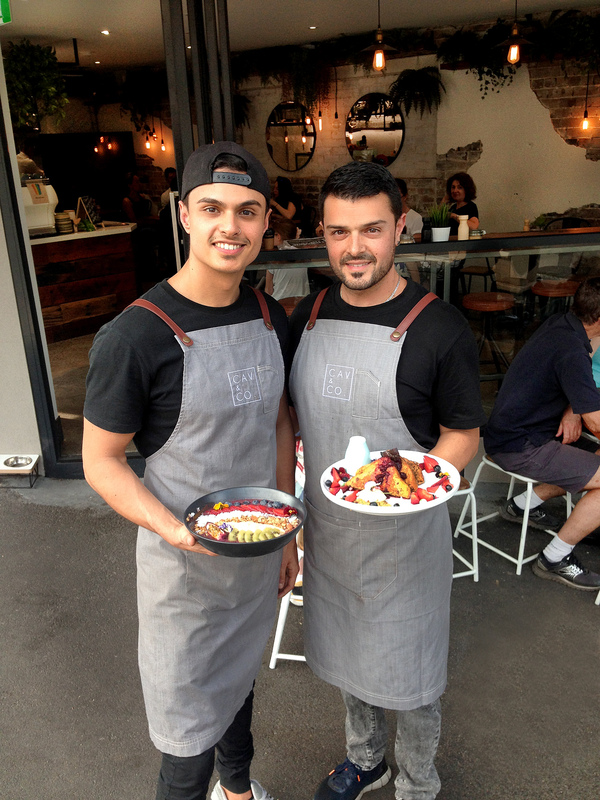 It takes hard work, dedication and passion to make a small business work and with Cav & Co it's obvious they found the right formula with the bright and inviting layout, the menu and the young, friendly staff. Cav & Co have indoor and outdoor seating as well as a window seating section. Amanda also tells us, "Sunday brunch is definitely very popular with many regulars, although we are busy throughout the week for breakfast and lunch as well. As the weather warms up we may even consider opening for dinner, but for now we're busy with the hours we're already open." The weather was very warm for this early in spring on the day we were there so all the doors and windows of the café were open. There was a fresh, open feel about the whole place. Mark, my colleague ordered the salmon salad and I had the chicken wrap. "I wish I could have a salmon salad like this every day, it is scrumptious", says Mark as I bite into my juicy chicken wrap. 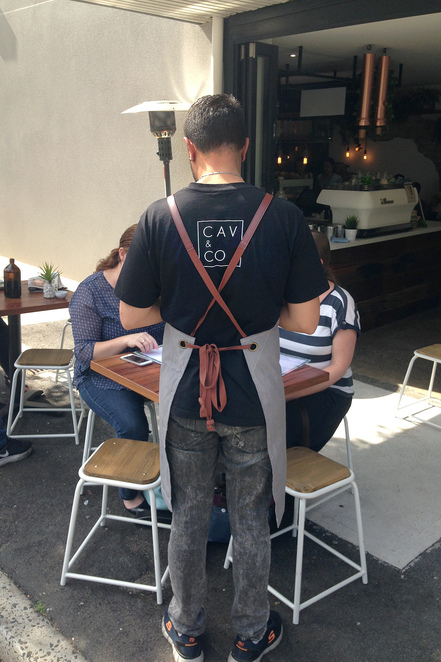 The young staff uniformed in aprons sporting the Cav & Co logo breeze in and out of the kitchen with plates laden full of fresh produce and they were very attentive of all the café patrons. The all-day breakfast is full of choice for any brunch aficionado. From a variety of toast through to house-made Granola and the Cavocado Smash – avocado on toasted soy linseed quinoa sourdough with poached eggs, cherry tomatoes and halloumi cheese sprinkled with dukkha. Corn Fritters, Eggs Bene and the one to satisfy even the biggest hunger – The Big Cav, which is… wait for it - eggs your way, grilled tomato, bacon, pork chipolatas, mushrooms, spinach, hash brown, with organic sourdough. Cavlova French Toast. We'll be back for more of this dish. There are so many choices but the standout brunch choice for me is their Cavlova French Toast, which we sampled as our 'dessert'. Soft, fluffy thick sliced toast perfectly covered with egg, presented with vanilla mascarpone, raspberry caviar, berry compote, pistachio crumble, fresh fruit, maple syrup and meringue. Just the smell of this dish made our mouths water. Mark and I managed to polish it off even though we were no longer hungry, and delicious doesn't even come close to how good it tasted. Superfoods anyone? Acai Bowl served daily. 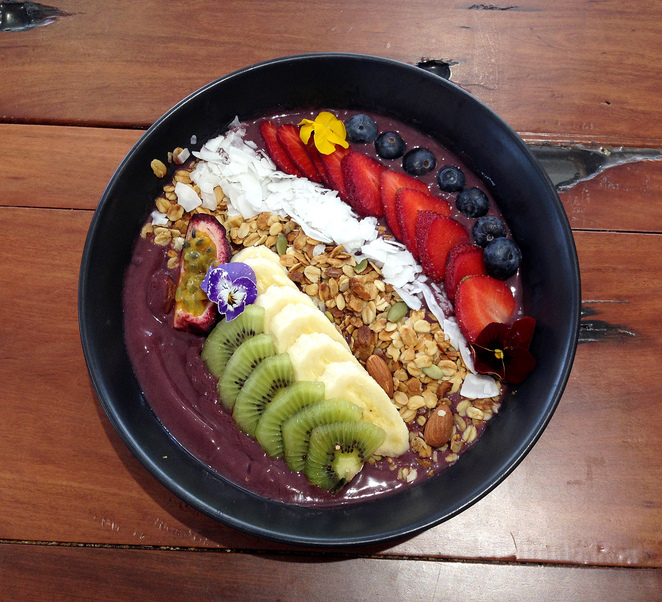 The Acai Bowl is another brunch favourite. A bowl of this amazing superfood is served with fresh seasonal fruit. I have to admit I'm not a fan of Acai but Cav & Co's menu has enough variety to please all tastes. Speaking of tastes, of course, kids are catered for and whilst we were enjoying our Cavola French Toast, 'the little pink beads' that pop in your mouth fascinated two little girls at the next table. Of all the things this amazing dish had, they focused on the smallest items on the plate. Lunch is served from midday with the choice of burgers, grilled crispy skin salmon, open melts, arancini, wraps and sandwiches. There are also salads – Smoked Salmon, Moroccan Chicken, and Veggie Delight. Let's not forget the coffee and fresh juices too. Make your own concoction or there are a few suggestions on the menu. I tried the Daily Boost – celery, carrot, pineapple, orange and ginger. A very refreshing juice that was perfect for the unseasonably warm day. Cav & Co is a friendly, family-owned café. We felt welcomed from the moment we walked in, and this along with the fresh food served with a smile, will ensure we'll be back again. We felt like regulars on our first visit. When: Sunday brunch here we come. Cost: $$ better than city prices.